In the past month my cousin has given birth to her and her husband’s first child – a baby girl. And I have been thrown around in a sea of emotions in a way that hasn’t happened in quite some time. I was on edge even before my little second cousin was born. I had dreams about holding my own baby daughter, and one night I awoke in a panic because I reached out and couldn’t find her crib at the side of our bed. I felt angry that we didn’t have a child that would be an elder cousin to the new little baby that was about to be born. I wanted our child to be there to play with her and cuddle her and show her how to get away with as much mischief as possible. I wondered what it would be like to feel life growing inside of me, to feel those kicks and movements, and to give birth and experience that pain that would bring our child into the world. Would our cousins’ baby and ours share any features like my cousins and I do? Perhaps eye shape or hair colour or love of animals or interests in music or art or who knows – and we will never know. In writing that last sentence I have just realised something. We will never know, but I will think about it from time to time and I like the thought of that. 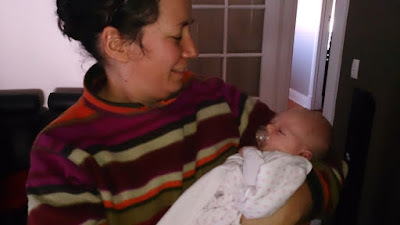 As our new baby cousin grows and starts showing her own personality (although I suspect she is already doing that…), and we learn what she likes and what she doesn’t, I will think about what interests our baby might have shared with her. Of course our baby would no longer be a little child – they would be seven years old if the second round of IVF had worked (where we had an embryo put into my womb) or six years old if the third round had worked. I love the thought of our child, our nephew (almost five years old), and the new baby spending time together. I think my cousins’ little girl would have been quite well looked after and spoilt by her two older boy cousins. I don’t really know if our baby would have been a boy, but I always thought that it would be – our little Jacob Arthur, Samuel Kirby, or Caleb Maxwell. It’s odd, therefore, that I dreamt about having a daughter before my cousins’ baby was born, but my cousins did know their baby was going to be a girl before she was born and I guess my subconscious decided that in my dreams we would have a girl as well. I felt guilty, at first, about some of the feelings of anger and, I’ll say it, jealousy I had, but I have remembered, yet again, that it is quite normal to have them. And it is also true that, at least for me, I will, from time to time, feel let down by life and sad about not having our own child. I want you all to know that as well, and that way when you experience those emotions that you feel are wrong or even shameful perhaps you will recognise that they are actually quite normal and then not be so hard on yourself – as I have been somewhat hard on myself lately. I love this post. So honest - about the pain and jealousy and guilt over those reactions - and so true too. True because you are right - these feelings are completely normal. And they might well ensure that you will have a beautiful relationship and special connection with your new baby girl cousin. You also got me thinking. I don't often imagine the children I lost to ectopic pregnancy - but if I hadn't, I'd have at least one that was 12 or 13. And your post allowed me to imagine them interacting with their 13 year old Australian girl cousin, or their 12 year old boy cousin, or little Charlie. It made me smile before I winced. Thanks Mali... I find thinking about what our kids might be like now good to do, but hard as well - perhaps saying I feel wistful is the right way to say it?